Hethum I (died 1271) (also transliterated Hethoum, Hetoum, Het'um, or Hayton from Armenian: Հեթում Ա) ruled the Armenian Kingdom of Cilicia (also known as "Little Armenia") from 1226 to 1270. 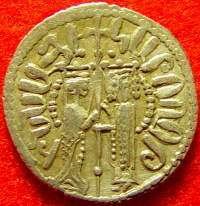 He was the son of Constantine, Lord of Baberon (d. 1263) and Princess Alix Pahlavouni of Lampron (a third-cousin of Leo I) and was the founder of the dynasty which bears his name: the Hetoumids. Due to diplomatic relations with the Mongol Empire, Hethum himself traveled to the Mongol court in Karakorum, Mongolia, which was recorded in the famous account The Journey of Haithon, King of Little Armenia, To Mongolia and Back by Hetoum's companion, the Armenian historian Kirakos Gandzaketsi. Hethum I (seated) in the Mongol court of Karakorum, "receiving the homage of the Mongols". Miniature from "Histoire des Tartars", Hayton of Corycus, 1307. Hethum was a major player in the political struggles and shifting alliances around the Crusader states, as the Armenians had ties with all sides. They were primarily aligned with the Europeans, but during Hethum's reign, the rapidly expanding Mongol Empire became a concern. As the Mongols approached the borders of Cappadocia and Cilicia, King Hethum made a strategic decision to submit to Mongol suzerainty, and sent his brother Sempad to the Mongol court in Karakorum. There, Sempad met Great khan Güyük, and made a formal agreement in 1247 in which Cilician Armenia would be considered a vassal state of the Mongol Empire. In 1254, Hethum himself traveled through Central Asia to Mongolia to renew the agreement, passing through the Turkish states of eastern Asia Minor, the Mongol camp at Kars in Greater Armenia, the Iron Gates of Derbent at the western shore of the Caspian Sea, and from there across Asia to Karakorum. He brought many sumptuous presents, and met with Möngke Khan (Güyük's cousin). The account of his travels was recorded by a member of his suite, Kirakos Gandzaketsi as "The Journey of Haithon, King of Little Armenia, To Mongolia and Back". The Journey of Hethoum was later translated into Russian, French, English, and Chinese. The narrative is important for its observations of Mongol, Buddhist, and Chinese culture, geography, and wildlife. On his way back from Karakorum, Hethum passed through Samarkand and northern Persia, also visiting the Mongol leader Bayju, where he was present in his camp to witness Bayju's victory in Asia Minor against the Seljuq Turks. Hethum strongly encouraged other Frankish rulers to follow his example and submit to Mongol suzerainty, but the only one who did so was Hethum's son-in-law, Bohemond VI of Antioch, who submitted around 1259. Armenian troops were with the Mongol army that captured Baghdad in 1258, and both Armenians and Antiochenes fought in the Mongol Army under Hulagu at the Siege of Aleppo and Fall of Damascus in 1260. Historical accounts, quoting from the writings of the medieval historian Templar of Tyre, often give a dramatic account of the three Christian rulers (Hethum, Bohemond, and the Mongol general Kitbuqa) entering the city of Damascus together in triumph, though modern historians have questioned this story as apocryphal. Despite the Mongol's territorial gains, in September 1260, the Egyptian Mamluks rallied, defeating the Mongols at the historic battle of Ain Jalut and driving them back across the Euphrates River. The Mongols would not again capture Syria until 1299–1300, when again they would hold it only for a few months. During the last years of Hethum's reign, largely as a result of Hethum's active support of the Mongols, the Kingdom came under increasing attack by the Mamluks, who invaded in 1266, taking 40,000 Armenians captive, (including Hethum's son, Leo) at the Disaster of Mari. Hethum was able to ransom his son by conceding territory to the Egyptians. In May 1268, the allied Principality of Antioch was overrun by the Egyptians. Hethum abdicated in 1270 in favor of his son Leo, and lived out the rest of his life in a monastery, as a monk. ↑ Morris Rossabi (28 November 2014). From Yuan to Modern China and Mongolia: The Writings of Morris Rossabi. BRILL. pp. 670–. ISBN 978-90-04-28529-3. ↑ "Hethoum I receiving the homage of the Tatars: during his voyage to Mongolia in 1254, Hethoum I was received with honours by the Mongol Khan who "ordered several of his noble subjects to honour and attend him"" in Le Royaume Armenien de Cilicie Claude Mutafian, p.58, quoting Hayton of Corycus. Edwards, Robert W. (1987). The Fortifications of Armenian Cilicia: Dumbarton Oaks Studies XXIII. Dumbarton Oaks, Trustees for Harvard University, Washington, D.C. ISBN 0-88402-163-7. Grousset, René (1935). Histoire des Croisades III, 1188–1291 (in French). Editions Perrin. ISBN 2-262-02569-X. Toumanoff, C. (1966). "Armenia and Georgia". Cambridge Medieval History, vol. IV.